This section presents my conceptual analysis of the organisation of the teaching practices for delivery of the undergraduate degree programme developed through the Ultraversity project, the BA (Hons) Learning, Technology, and Research. I later named the approach developed as the model of Work Focussed Learning. It was recognised at the outset of the Ultraversity project, and included by myself in the project plan as an aim, that to make the Ultraversity project a success, it would be necessary to, “Research new forms of organisation and work practice for teaching, administration, and support staff to change the practice of undergraduate higher education.” [P3 p1]. In my role as the director of the Ultraversity project, I responded to this analysis by establishing an action research (AR) strategy to inquire into the organisation of teaching. In constructing this section of my claim, I have analysed and reflected upon my working practices around the Ultraversity in terms of the organisational implications for HEIs seeking to develop online, distance, learning. Table 3 highlights the significant aspects of my practice and links this to my portfolio of evidence. In this section I will introduce the concept of productivity arrangements for teaching staff and explain why it is particularly significant for the development of Online Distance Learning (ODL). I will then explain the background to the Ultraversity project and the model of Work Focussed Learning. Next I explain the teaching practices developed and then I reflect on the Ultraversity productivity arrangements. In conclusion, I identify my contribution to knowledge and argue that new ways of working and productivity measures are required for supporting ODL if there is to be large-scale development of provision. Productivity arrangements for teaching staff in higher education (HE) are based largely on a model of delivery that assumes face-to-face campus-based activities, organised autonomously at departmental level. For many higher education institutions (HEI’s) there is now pressure to develop new markets; this increasingly includes approaches that require teachers to support students fully, or partially, through ODL. In 1990 the University and College Union (2011) negotiated a national contract of employment between the higher education teaching unions and HEI’s. Barrett and Barrett (2009, 10) argue that in post 1992 UK universities this has over time, “created a legacy of embedded practices” that are now the starting point for management of academic workloads (MAW), which for them are about efficiency, university objectives and equitable workloads (Barrett and Barrett 2009, 3). Taking a wider viewpoint, I use the term ‘productivity arrangement’ to mean the package of organisational measures that determine how teaching teams can respond to the pedagogical model they are using to assure course quality and to maintain a financially viable provision. These include contracts of employment, measures of productivity and the management and organisation of teaching teams. I argue that the legacy of embedded practices identified by Barrett and Barrett, has a significant impact on innovation in productivity arrangements. Developments in ODL that offer students collaborative and social approaches to learning at a time and place convenient for them requires new ways of working for teachers in HE; as identified by White et al., (2010, 46) there is less focus on delivering content and more emphasis on facilitating learning. There are many explanations put forward for barriers to the development of ODL. One issue is the lack of incentives for, and capability of, academics to develop online approaches that are often perceived as involving extra workload while delivering little personal advantage (Becker and Jokivirta 2007, 12; White, et al., 2010, 4). Hanson (2009) observes that teachers may well have strongly held beliefs about the value of face-to-face interactions with their students and that these are a central component of their sense of academic identity. From this perspective the preservation of the status quo can be seen as an “entirely rational act” (ibid., 562). The above explanations offer credible contributions to explaining the slow take-up of ODL in the UK. My own experience indicates that ODL requires markedly different ways of working to those required by standard delivery methods, particularly when adopting pedagogical approaches that depend upon facilitative approaches. I would argue that, if ODL is to grow significantly in HEI, there are challenges that need addressing around the role of HE teachers. An argument I would put forward in support of ODL and that that challenge the status quo with regards to teaching, is for whose benefit the system is intended to serve? For learners who, for whatever reason, are unable to take advantage of traditional face-to-face provision, there is a strong moral case for extending the opportunity to access HE. There is also strong economic rationale at an individual, institutional and national level for making it possible for more people to be able to develop higher level skills for the “economic and social health of the UK” (Leitch 2006, 1). However, from the perspective of an individual academic, the perceived risks of engaging with ODL approaches need to be resolved if they are to actively engage in the development of new practices. Thus, this section of my PhD argues that we need to re-examine current productivity arrangements with a view to making changes that support new, flexible ways of working. The Ultraversity project, begun in 2003, was designed to offer degree level study to prospective students who felt that the current offering from universities did not fit their lives. Although students studied in the workplace, the appeal to study was made to individual students and the approach was designed for the student to negotiate the relationship between their studies and their employer [P13; P22, p17]. The project developed an undergraduate degree programme with its own recruitment and enrolment processes, significantly reduced fee structure [P7 p2; P15 p2], and dedicated staff focused on supporting students online [P6]. This way of operating was possible because it was run through an independent unit, Ultralab, at Anglia Ruskin University. It is my experience organising the delivery of the validated undergraduate degree programme, specifically the teaching and work-practices developed that underpins my critique of productivity arrangements. The model of Work Focussed Learning was designed to offer an undergraduate HE to students in full-time work, paid or voluntary. The target group of students were committed to the work they were doing, wanted to gain an undergraduate degree in three years, but were unable to stop working and devote the time needed to obtain a degree via conventional routes. is innovative in its expectations of teaching staff. Student support was wholly online and was based around a Community of Practice (Wenger 1999) where students help each other and academic staff facilitate discussion and provide guidance, thus allowing learners to study at a time and place convenient to them. Students are required to undertake projects that improve their work practices and benefit their workplace using an action research approach. They structure their inquiries to enable them to gain academic credit from the scholarly practices used to inform and evaluate their activities [P23 p7]. As a design, the curriculum can be seen as a spiral curriculum (Brunner 1960, 11) in that the action research process is revisited for learners to develop increasing proficiency with the techniques and approach “‘A curriculum as it develops should revisit this basic ideas repeatedly, building upon them until the student has grasped the full formal apparatus that goes with them” (ibid., 13). Through feedback from recruited students, we found that they were looking for a more convenient, and less expensive route and were unable to take advantage of face-to-face on campus provision. These students wished to complete a degree in three years through making their work the focus of their study [P2 p2-4; P22 p18]. Teaching practice in HE is diverse with differences found between subjects, modes of delivery and institutions (QAA 2011, 6). Nevertheless, it is common to timetable contact sessions in classrooms, studios, laboratories, or workshops where teaching will take place. Although there may be a trend towards a greater role for online teaching, often as a part of blended learning strategy, the timetable is the primary determinant of the ‘when and where’ teaching takes place. As discussed later, this practice is closely associated with commonly found measures of productivity, management and organisation, and the contract of employment for teaching staff based on contact time. The following description of the Ultraversity model of teaching and work-practices is synthesised from a detailed pattern language description [P20] and developed to support the model of Work Focussed Learning. I have identified three themes of practice: activity design; facilitating the online community of inquiry; and distribution of teaching effort. Taken together, these require a new combination of skills and working practices where timetabled contact is no longer the backbone for organisation. The roles of tutors, lecturers and course designers are combined into that of ‘learning facilitator’ and this has implications for the contract of employment, to which I shall return. As the project director, I made a significant effort in developing a team that had little experience of teaching in HE, although well qualified academically and experienced schoolteachers. Throughout the project, regular face-to-face professional development sessions were run where the distributed team could come together develop the Work-focussed Model [P8; P9; P12]. In the work-focused approach, the learner is required to be self-directed, with the curriculum concern of learning facilitators being to help students solve authentic problems in their workplace and become effective agents for change whilst producing a scholarly portfolio of work for assessment. There is no fixed syllabus and this means that activity design and the resources produced are to support the learning process, not to deliver subject or discipline content. As with many approaches to ODL, a significant effort is required for activity design prior to the start of a course and the development of learning resources; this is one of the roles of the learning facilitator. In the case of Ultraversity, the resources are digitally created and maintained by learning facilitators, so ongoing refinements and clarifications are made at minimal cost. This is in contrast to models whereby production teams are responsible for working with academics to develop content and publish it online. Reflecting on the differences, the latter approach offers the prospect of better production quality but with a greater resource requirements and a slower time to publication. Assessment is an integral part of the activity design and during the development stage of the Ultraversity project, following the validation, I attended a SEDA conference at New Hall, Cambridge that introduced the Patchwork Text approach (Winter, 2003). 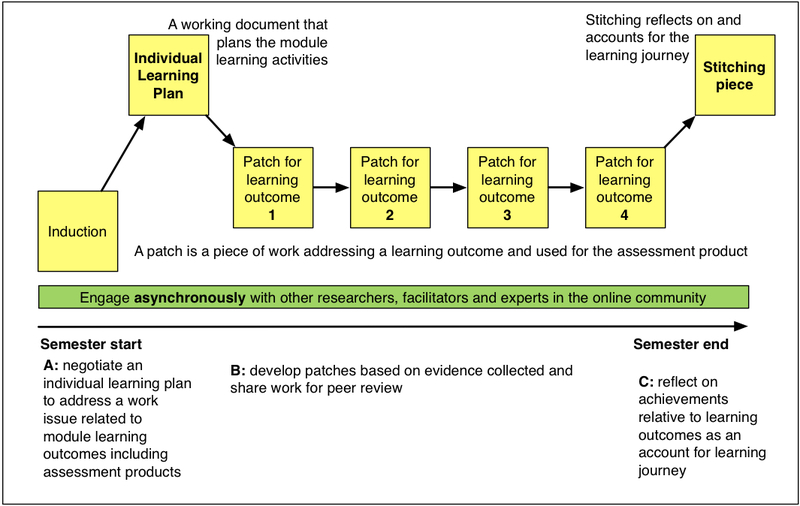 A synthesis of the approach outlined by Winter and the ideas contained in the validation documents resulted in the Patch-work Media approach (figure 5), which sets out a template activity and assessment design common to all Work Focussed Learning modules. The key ideas behind Patchwork Text are that it aims to unlock students’ skills and creativity by encouraging them to use a range of genre in their writing, not limiting their forms of expression to that of academic literacies, which may, for some, be off-putting and difficult to master, perhaps due to experiences of failure early on in their academic career. The approach also requires learners to author pieces of work (patches) based on real work experiences and to offer them for a process of peer feedback in learning sets, through regular face-to face meetings, and adopting a critically reflective approach. At the end of the module, a relatively modest ‘stitching’ piece provides an account of the learning journey undertaken and is the main focus of the summative assessment. The approach developed by Ultraversity brings to this mixture the use of different forms of media and takes place entirely online, and is action oriented rather than critically reflective on a work place experience. In addition, each learning outcome has a patch associated with it to give a simple repeated structure. Working through Figure 4, the process starts with learners negotiating and agreeing an individual learning plan with their facilitator, which details the work they will undertake to tie in with their work-focussed action in the workplace and relate to the learning outcomes and assessment criteria. This agreement provides confidence for both the learning facilitator and the student that they will be able to produce a piece of work or patch for each learning outcome. As part of the negotiation, learners choose the genre and media they wish to use to develop their assessment products. The student is encouraged, where possible, to use their communications to work colleagues or stakeholders, thus making workplace reports and meetings a focus for the patch and combining work and learning. These address each module learning outcome with a reflective retrospective commentary or ‘stitching piece’ at the end of the module to explain for their learning journey. This approach seeks to provide individually negotiated study that within the constraints of a viable business model. The working environment for staff engaged in ODL is clearly different from that of face-to-face teachers and requires additional skills (Salmon 2000, 51-70). Garrison (2007, 69) emphasises the need for clarity of purpose, roles and responsibility in the Online Community of Inquiry, in particular as they relate to the academic requirements that need to be met to gain a qualification. Placed less emphasis on the directional aspects of the instructional role and instead focuses on the importance of modelling desired behaviours such as critically reflecting on their own experiences [P21 p68]. In the Work-focussed Model, instead of a classroom to manage, there is the requirement to develop and coordinate online environments where students, learning facilitators and expert guests can interact, predominantly through asynchronous means. This is part of the role of the learning facilitator. The activity design was mediated through a Virtual Learning Environment, but also includes a range of other technologies that I sought to encourage the use and development of [P21 p71]. This required facilitators to possess some degree of technical skills to ensure resources are made available and learning activities set-up. In addition, facilitation skills are needed to provide stimuli; steer interventions in the asynchronous online conversations; model desired behaviour of critically reflective inquirers (Brockbank and McGill 1998, 53) and monitor participation. This complexity is in part managed by the educational approach of creating learning sets for small groups of students in which they conduct peer reviews of each other’s work by offering critical feedback to each other [P17 p5; P20 p68]. A high level of informal social interaction and interpersonal support took place through the wider Community of Inquiry as well as focused discussions in the learning sets. In addition, submission of assignments, marking, moderation, scrutiny by the external examiner and return of work and feedback to student’s portfolios all took place online. One of the major impacts of the activity design described above is on the distribution of teaching effort including assessment activities. In Figure 6, I offer a schematic representation of teaching resource where the activity design envisages comparatively high levels of input by learning facilitators developing resources to support the activity design, and at the outset of a module when learners first familiarise themselves with the module requirements and raise any uncertainties in the online communities for facilitators to clarify. At this stage explanation and interpretation of the module requirements is a key aspect of the facilitation role. In parallel with this, learning facilitator and students are also negotiating and agreeing individual learning plans. This can be contrasted with ‘traditional’ lecture based approaches with their rhythm determined by weekly timetabled sessions and terminal assessments. My experience, as a part of the Ultraversity teaching team, shows that after the first few weeks this work decreases as students work through their plans and increasingly support each other by offering critical feedback as they share their plans and findings. The learning facilitator role shifts to ensuring that the module is progressing at an appropriate pace and this is achieved by interventions that highlight what should be achieved to meet module requirements and the deadlines for assignments and some input into formative assessment. It is worth noting that the effort required of staff for marking the final assessment is greater than that which is required for many other forms of assessment; assessing individual media-rich contextualised work-focused portfolios for each module is more akin to assessing individual dissertations than marking a set essay or exam. management and organisational organisation of teaching staff. As background to this section, it is important to note that the predominant delivery paradigm of most undergraduate programmes is based upon three conceptual structures: modularisation, the breakdown of curricula into constituent parts; the use of semesters/trimesters as a framework for delivery and assessment patterns; and levels that indicate bands of expected intellectual achievement. Modularisation was introduced in order to increase flexibility and choice for students at a time when ODL did not need to be taken into consideration, because it was still in its infancy. The structures and practices developed to support modularisation can now act as a barrier to change because they constrain choices about the ways in which courses can be delivered and managed. As outlined in Section 3.2, for post-1992 institutions, new developments in ODL are being played out against the backdrop of the current national contract of employment for academic staff. Of particular relevance, is the key agreement of ‘formal scheduled teaching’ up to a maximum of 18 hours per week within a total maximum of 550 hours per year over 36 weeks. Other factors taken into account, that may reduce this number, include development needs, student numbers, class sizes, subject specific requirements, development of new provision, and management responsibilities. The HEFCE report on, “The Higher Education Workforce Framework 2010”, highlights the ongoing debate in HE about the impact of the 1992 contractual arrangements. Two positions are identified. On the one hand that such arrangements can be implemented flexibly, and as such have a neutral effect on innovative practice, and the other, that the “customs and practices that have built up over the years are now so ingrained within institutional culture that they form the most challenging barrier to increased workforce flexibility.”, particularly when different modes of working are required to meet institutional developments in teaching provision (HEFCE 2010, 12,14, 50). The Online Learning Task Force (2011, 16), supports this idea, “academic contracts in many post-92 institutions may constrain development because of hourly quotas assigned to teaching time”. The contract of employment described above was set aside for personnel during the lifetime of the Ultraversity project. Instead, staff made decisions about how they divided their total annual 1647 working hours to meet their teaching, administrative, research and scholarly practice responsibilities. If they had other roles beyond the project, this was accounted for through reduced Ultraversity workload decided in consultation with the Ultralab management team. I choose to emphasise the point about contracts of employment because I believe that it was the ability to work outside the common interpretations of the post-1992 contract of employment that, in part, made it possible to develop team teaching approaches for the Ultraversity project. In turn this required staff to have a high degree of trust in the professional integrity of colleagues as they depended on each other for the teaching activity of facilitating the online communities on modules they shared and for the timely provision of learning materials that other people had developed. Although common in school settings, in my experience this is not typical for HE where the academic teacher most commonly operates alone in preparing materials and teaching students. The management and organisation of this team teaching approach is discussed further in Section 3.6.3 in the context of my practice as the director of the Ultraversity project. The measures of productivity used for teaching staff in HE are generally very crude. Commonly, a 30 credit module might be timetabled in a room for 36 hours face-to-face teaching spread over a semester in various combinations of 1 hour blocks. In my experience, middle managers use timetabling data as the de facto measure of productivity based on an individuals teaching workload. They then engage in a process of ‘horse trading’ to develop a solution that feels fair in the context of the annual 550 hours of ‘formal scheduled teaching’ that contracts of employment stipulate. This is a rudimentary approach in the sense that workload, particularly marking, may vary according to class size. However, it is the case that MAW approaches, outlined in section 3.2, are gaining increasing traction in the sector, seeking to better quantify work-loads. Issues of the balance between pricing and costing are a significant challenge for HE and the Ultraversity project was required to develop a financially viable model. For the UK sector as a whole the ratio of teaching staff to student varies from 1:12 to 1:30 (guardian.co.uk, 2010). As a starting point, the Ultraversity project used a ratio of 1:25 for teaching teams of 3 staff, giving approximately 75 students in total per team; an approach based on the number of students per member of staff, rather than number of contact hours. This is made possible because the role of learning facilitator is not one of subject expert for a particular module, but rather to support the learner through a process driven curriculum. The focus on online asynchronous communications meant that learning facilitators were able to have flexible work patterns that were not determined by timetabled contact sessions. This includes home working, and ‘team teaching’ but working within agreed parameters such as tutor response expectations. This places different demands on staff, but also makes possible a shift, focusing productivity measures on the outcomes for students, rather than on input as measured by timetabled face-to-face contact. The discourse around new managerialism in HE (Deem, Hillyard and Reed 2007; Deem and Brehony 2005) can be helpful in trying to understand challenges for development of new working practices and the power relationships between the managers and the managed in HE. The managerialism analysis outlined below is one interpretation of the context in which any innovative management approaches, such as those developed for Ultraversity, and working practices will have to operate if they are to be in the HE mainstream. It is the middle managers, heads of departments, who are largely responsible for the coordination of teaching activities. Where online developments are based in existing organisational structures, it is they who are faced with the challenge of sustaining smooth running of the ‘traditional’ face-to-face delivery based on modularity and semesterisation, and at the same time as ensuring resources are available for new ODL courses that have different requirements. Usually this is achieved by working within externally imposed staffing and budgetary constraints and increasing external accountability through league tables of performance and audits of operations (Deem and Brehony 2005, 225; Deem, Hillyard and Reed 2007, 53-55). All of this is undertaken in the direction outlined by institutional strategy documents, but in a culture of academic freedom, of which there is a strong and actively guarded tradition in UK HEI (Karran, 2009). Thus the job of allocating staff time for given activities is riddled with conflicting demands. Trowler (1998) summarised the key features of managerialism in higher education as involving: management’s right to manage; a top-down approach, involving a ‘‘technology’’ of management and a ‘‘policy science’’ approach; an orientation towards the market and customers; individualism and acceptance of the status quo; and in education ‘‘an atomistic and mechanistic understanding of knowledge and learning (Ibid., 10). Time allocation approaches vary: from informal, where the head of a department arranges work based on negotiations with staff; partial, where contact hours form the basis of negotiations possibly as part of contractual agreements; and comprehensive, approaches where algorithms are used that take account of teaching, research and administration duties (Barrett & Barrett 2007, 55-17). The trend to actively manage the workload of academic staff is highlighted by Barrett & Barrett (2009, 3) in their report focusing on the management of academic workloads and working practices. This is based upon the collection of data and development of models and to allow for ‘workload balancing’ calculations and to arrive at a fair outcome for the individual. These approaches are justified by the claims that they will lead to a fairer and more transparent workload allocation and enable institutions to more efficiently manage their resources to meet the institutional goals. For some, this micro-management of academic workloads is an example of universities “preoccupied with ‘modernising’ management practices” (Malcolm and Zukas 2009, 496). This encourages a false division between the roles of an academic; teaching, research, scholarly practice and administration – the “official and academic versions of academic work” (ibid., 503) or what Argyris and Schön (1974, 6-7) might characterise as, ‘espoused theory’ versus ‘theory-in-use’. Whatever position is taken, there is considerable evidence that the management and organisation of teaching including the management of academics workloads is in practice a complex component of the overall productivity arrangements for HEIs and thus ripe for innovation. The approach developed by the Ultraversity project overcame the organisational and managerial constraints discussed above and in particular the organisation arrangements detailed in the section ‘Online Community of Inquiry’. I argue that the approach enabled middle managers to play, “a creative and innovative role in education” (Clegg and McAuley 2005, 31). 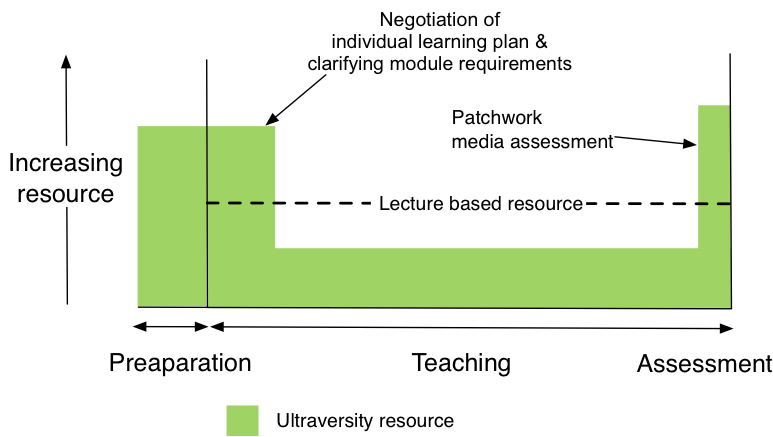 The Ultraversity teaching teams were given responsibility for self organising arrangements that took into account the work to develop modules, time to teach the students, marking assessments and quality assurance requirements of the university. In addition to cohort specific activities, all staff had responsibility for development of the whole pathway including undertaking action research activities and the development of the pedagogical model, content and technological infrastructures associated with the online learning environment. An online Community of Practice (CoP) for a Distributed Team [P11] was used to organise activities across the project’s learning facilitators who were a distributed set of workers – using a similar methodology to that applied to students. Activities included the daily collaboration between staff delivering modules, assessment process, developing resources, periodic pathway meetings for quality assurance processes, ongoing course development, and ongoing monitoring and overall coordination of the project team. This approach required the whole team to work collaboratively to plan, implement and evaluate the development and delivery of courses. This is a systems based approach that sees a manager’s role as one of creating the conditions whereby staff can absorb the variety of requirements placed upon them by taking responsibility for, and planning their own actions rather than a command and control approach distanced from the reality of the work (Seddon 2008, 70-71). The risk identified by Seddon is that the identification of poor measures or targets creates a ‘de facto’ purpose other than the true purpose of the system. This then constrains the methods that are developed to meet the targets set (Ibid., 82). In this case, the purpose of the system is not for teachers to be in a classroom for a set amount of hours, but about meeting the needs of learners. The approach which was developed shifted the focus of productivity arrangements to a learner centred model rather than timetable measures of input or micro-management of staff time. This design raises the question, when trying to develop new approaches to ODL is there a need to reinterpret the productivity arrangements and perhaps revisit the contract of employment bargain at a national level? This productivity arrangement expected the teaching staff to self-organise in teams. When combined with alternative productivity measures, management, and organisation practices this provided a working environment to nurture creative and imaginative solutions to organisational problems as described in this section of my PhD claim. It is also a challenging approach for those managers who may seek to have a high degree of control over staff’s activities. This was addressed to some degree, in my Ultraversity work, by forming an online community of practice for the staff in which activity was transparent, usefully complementing that in the student’s online community of inquiry. In the conclusion to this section, I have reflected on the question, “what are the organisational implications for HEIs seeking to develop online, distance, learning? Will Hutton (2009) made the compelling observation that as uncertainty increases in the global economy, businesses will need increasing flexibility and this will require increasing ‘contractual flexibility’ from workers. In my experience, a key practical question that arises is the way in which institutions reconcile their current productivity arrangements with new ways of working that are not built around the traditional face-to-face campus paradigm. This requires organisations to think fundamentally about their business models, that is their value proposition, profit formula, resource requirements, and business processes (Christensen, et al., 2011, 32). A failure to provide an effective answer to this question has the potential to be a significant barrier to the transformation of teaching and learning in ODL. “focused on the dual objectives of developing creative approaches to solving human teaching, learning, and performance problems while at the same time constructing a body of design principles that can guide future development efforts”. In my own work described above, the adoption of different management and organisational approaches have proved to be the catalyst for the changes in teaching and learning required to support Work Focussed Learning. The emphasis on self management of the individuals’ workload and the use of student- teacher ratio as a measure of productivity, were intended to unlock the creative energies of teaching staff to identify a set of teaching practices and methods that met the needs of the specific set of students and in this particular context it proved to be effective. There were, however, found to be challenges in this way of working for teaching staff [P20 p96]: the different and new competencies required; challenges to established identities as experts rather than as facilitators of learning; developing team teaching and working; developing skills and understanding of new technologies; taking responsibility for developing new working practices; and for some having to reconcile the differences between being a performer in a face-to-face context with reliance on text. This section has identified three themes: Contract of Employment, Measure of Productivity and Management & Organisation. I believe that the alternative proposals drawn from my practice, and identified in this section, are significant in seeking a step-change in the development of online distance learning. The implementation of such approaches within the constraints imposed by existing organisations work practices and governing regulations is probably beyond what could be considered a reasonable proposition. However, the use of some of the ideas explained in this section has the potential to enable HE institutions to think again about how they organise their online provision and to better understand the tensions between existing ways of working developed for face-to-face campus based provision and the changes that might be required to enable new practices to be developed for a different set of circumstances. This will be different from institution to institution, and dependent on the particular context and mechanisms that they wish to develop or change. development of the Patchwork Media approach to assessment. The model of Work Focussed Learning formed the basis of my employment in a different HEI as a Reader in Inquiry-based Learning. In that new role, I took the ideas developed by the Ultraversity project as the basis for the IDIBL project, which had the aim of developing new work-focussed courses across the institution. This is the focus of the next section of my PhD claim.